Crémant d'Alsace is the most consumed sparkling in France. Most of it is pretty simple, but offers a refreshing drink. But there are also producers with higher ambitions. They are not many, but have two things in common: Chardonnay and long bottle aging during the second fermentation. It is during this time sur lattes the wine gets its complexity as they dead the yeast is slowly degraded. 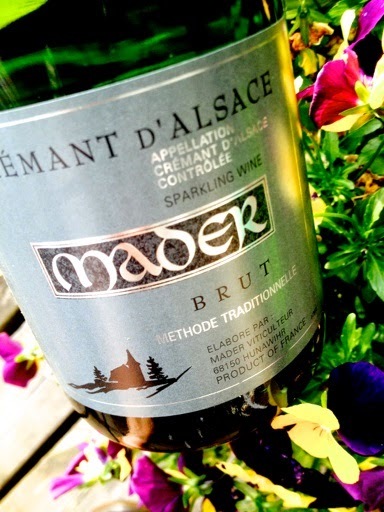 Crémant d'Alsace from Mader in Hunawihr is made from 50 % Chardonnay and 50 % Pinot Blanc, at least in the currently sold vintage of 2010. The color is medium deep, greenish yellow. The aroma is rich and dense with brioche, walnuts and lemon. The palate is medium-bodied, abit ustere but elegant with lots of fruit embedded in super acids balanced by 5.5 grams dosage . The aftertaste is long and convincing, a result of an entire 30 months sur lattes . One of the best in all Alsace. Price: € 8.50.